Cold Fusion GT was the new butterfly-shaped aluminum yo-yo from Playmaxx released in late 1998. It had the same high-tech features as the standard Cold Fusion: precision machined aluminum, advanced ball bearing axle system, weight distribution, patented brake pad technology, and two-tone anodized yellow and black finish. It came with a round manual, replacement brake pads, yellow/black strings, and 3 interchangeable fixed axles (1 brass & 2 wood). 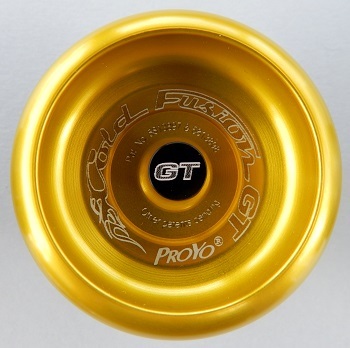 The GT also came packaged in its metal containment cannister with one Cold Fusion pin, one World Team ProYo pin, and a gold ProYo yo-yo glove. These yo-yos in the canister occasionally come up for auction, but in most instances they are missing one or more accessories. If you are interested in such a yo-yo on an auction site, use the reference image - "Complete contents" - in this exhibit to help you make an informed bid. Originally, the GT was machined by Custom Yo-Yo of Gilbert, AZ, maker of the MAG series of yo-yos and others. See Custom Yo-Yos in this museum. This yo-yo was also made in less-expensive plastic versions: Turbo Bumble Bee GT with a bearing and the economical Profire GT with a transaxle. Original retail price: $135 US.